An Ebook version of the hard-cover book Pandit Sriram Sharma Acharya As I Knew Him, by J. C. Pant (Founder, REACHA), is available on this page. If you like the Ebook and would care to contribute to REACHA's work for child development, education, environment protection, and eco-restoration - please consider ordering a hard-cover copy of this book. What began as a thumb-nail sketch of a biographical description of Pandit Sriram Sharma Acharya, GURUDEV to the author, gradually evolved into an autobiographical narration of a seeker who happened to be a civil servant of India during his long and active career in the IAS. A reader may prima facie well come to the conclusion that this is less about the Guru and more autobiographical and that even the title of the book is inappropriate. Going through the pages would however, gradually remove this impression. 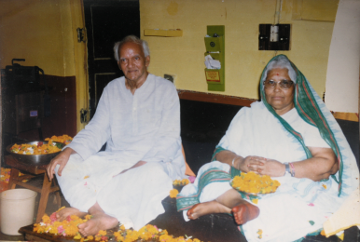 “The full report” that the Guru demanded of the shishya every time they met during the eleven years from 1979 to 1990 became the ready raw material for the book. This autobiographical narration describes the manner in which the Guru skillfully steered and guided the personality of the disciple, and the description of this impact on the latter, throws a volume of light on the essential persona of the former. The Guru was by any reckoning a super human being who initiated the Yug Nirman Movement in 1953 to change the way people self-centredly usually think and behave. During his own life-time of eighty years, he made this come about around him and actually came to see this change taking place gradually in society the world over. 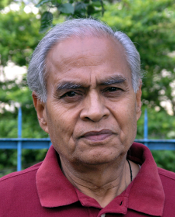 Pandit Sriram Sharma Acharya was a self made secular-minded Indian from a deeply religious Bhagwat family, a genuine freedom fighter, who even refused the pension that the populist government granted him, who did not receive formal education beyond the primary stage, but grew up to the prophetic stature of perhaps, the wisest man of his age, to be addressed as YUG RISHI, who could peer into the past and look far into the future at first sight, one who knew every known science and all the sacred books of Vedic traditions as well as the great writings to date. He was a true “Bharat Ratna”, a real “Vishwa Ratna”. For further details about the author see the last section of the book.